AXIS Q1765-LE network camera is a slim, bullet-style outdoor-ready network camera with 18x optical zoom and auto-focus. It delivers SMPTE-compliant HDTV 1080p video in multiple, individually configurable H.264 and motion JPEG video streams. The built-in IR illumination is provided by four, auto adjusting LEDs that are highly power-efficient. AXIS Q1765-LE can cover great distances providing both wide overviews as well as detailed images for identification purposes. In addition, Axis' unique Corridor Format allows effective monitoring with more resolution in vertical scenes such as long streets or long perimeters. 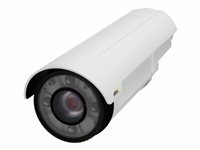 All features integrated in bullet-style AXIS Q1765-LE network camera is a slim, bullet-style outdoor-ready network camera with 18x optical zoom and auto-focus. It delivers SMPTE-compliant HDTV 1080p video in multiple, individually configurable H.264 and motion JPEG video streams. The built-in IR illumination is provided by four, auto adjusting LEDs that are highly power-efficient. AXIS Q1765-LE can cover great distances providing both wide overviews as well as detailed images for identification purposes. In addition, Axis' unique Corridor Format allows effective monitoring with more resolution in vertical scenes such as long streets or long perimeters. Convenient installation AXIS Q1765-LE is very convenient to install thanks to its light weight, one-cable installation, readily directed IR, support for standard Power over Ethernet and 24 V DC/AC input. The cameras mounting bracket is designed for installation on walls or ceiling of buildings for monitoring of entrances and perimeter. Together with compatible accessories, the AXIS-Q1765-LE can be mounted on poles for surveillance of parking lots or general city surveillance purposes. 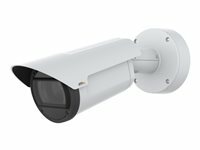 AXIS Q1765-LE PT Mount Network Camera is a slim, bullet-style outdoor-ready network camera with 18x optical zoom and auto-focus. It delivers SMPTE-compliant HDTV 1080p video in multiple, individually configurable H.264 and Motion JPEG video streams. Furthermore, the camera features Axis' OptimizedIR with four auto-adjusting LEDs that are highly power-efficient. 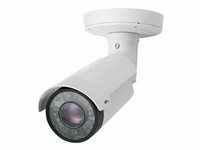 All features integrated in bullet-style AXIS Q1765-LE PT Mount Network Camera is a slim, bullet-style outdoor-ready network camera with 18x optical zoom and auto-focus. It delivers SMPTE-compliant HDTV 1080p video in multiple, individually configurable H.264 and Motion JPEG video streams. Furthermore, the camera features Axis' OptimizedIR with four auto-adjusting LEDs that are highly power-efficient. Convenient installation AXIS Q1765-LE PT Mount is very convenient to install thanks to its light weight, one-cable installation, readily directed IR, support for standard Power over Ethernet and 24 VDC/AC input. It has a serial port for RS422/485 communication with pan-tilt motors that support Pelco D protocol. As effective outdoors as indoors Engineered to be just as effective outdoors as it is indoors, AXIS Q1785-LE can withstand temperatures between -40 °C to 60 °C (-40 °F to 140 °F). It has electronic image stabilization and IK10 rating for impact resistance. It's IP66-, IP67-, and NEMA 4X-rated for protection against ice, water, corrosion and dust. And its defog functionality ensures clear images despite fog or smog. In other words, AXIS Q1785-LE can take whatever nature - or human beings - throw at it. And still come out on top. Large zoom and wide range Go ahead and place AXIS Q1785-LE almost anywhere to capture your targeted surveillance area. You'll be able to count on superior, high-resolution footage - still or motion-packed - in bright light, backlight or absolutely no light at all. That's because AXIS Q1785-LE features 32x optical zoom, Axis OptimizedIR at up to 80 m (262 ft) and HDTV 1080p at up to 60 fps. It's got Axis Forensic WDR for clarity even when there are both dark and light areas in the scene and Axis Lightfinder for high-quality - color - images recorded in near darkness. And Axis Zipstream preserves the forensic detail you need, while lowering bandwidth and storage requirements by 50% or more. As effective outdoors as indoors Engineered to be just as effective outdoors as it is indoors, AXIS Q1786-LE can withstand temperatures between -40 °C to 60 °C (-40 °F to 140 °F). It has electronic image stabilization and IK10 rating for impact resistance. It's IP66-, IP67-, and NEMA 4X-rated for protection against ice, water, corrosion and dust. And its defog functionality ensures clear images despite fog or smog. In other words, AXIS Q1786-LE can take whatever nature - or human beings - throw at it. And still come out on top. Large zoom and wide range Go ahead and place AXIS Q1786-LE almost anywhere to capture your targeted surveillance area. You'll be able to count on superior, high-resolution footage - still or motion-packed - in bright light, backlight or absolutely no light at all. That's because AXIS Q1786-LE features 32x optical zoom, Axis OptimizedIR at up to 80 m (262 ft) and HDTV 1080p at up to 60 fps. It's got Axis Forensic WDR for clarity even when there are both dark and light areas in the scene and Axis Lightfinder for high-quality - color - images recorded in near darkness. And Axis Zipstream preserves the forensic detail you need, while lowering bandwidth and storage requirements by 50% or more.